The Port of San Diego is seeking public input on plans for future development of the downtown waterfront from the airport to the convention center. The agency is asking San Diegans to complete an online survey and attend a public open house on Jan. 30 at the port’s headquarters. The downtown embarcadero, an area known as “San Diego’s front porch,” includes the Maritime Museum, cruise ship terminals, the Midway Museum, the First Market Restaurant and Seaport Village. The area is also home to the future Brigantine Portside Pier restaurant development, which is currently under construction and scheduled to open in 2019. 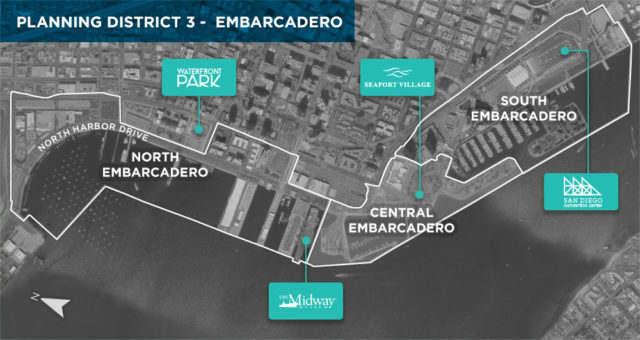 The Port is seeking feedback on the public’s preferred uses for the embarcadero, specifically the north and central embarcadero, because of the great interest both residents and visitors have in this highly visible area. The public open house is set for 6 p.m. on Wednesday, Jan. 30, at the Port of San Diego Administration Building at 3165 Pacific Highway. The port manages 6,000 acres of waterfront land stretching 34 miles along San Diego Bay and spanning five cities. It does not collect tax dollars, but generates revenues through fees and leases.